Pere Magloire | 20 YO Calvados | Apple Brandy | French Brandy | 20 Year Old Calvados — Emporia Brands Ltd.
Père Magloire welcomes you warmly to the world of Calvados, the fruit of Normandy. Père Magloire maintains a position as the market leader brand of Calvados broth in France and throughout the world. Making Calvados requires several steps, each step calls on a know-how, a passion and specific skills. Everything begins in orchards where one grows specific apple varieties. After harvesting, these apples will leave the orchards and cider will be made. Distillation of the cider follows to create the brandy, then, the patient work of the cellar master begins in the secret cellars and the time of ageing has come...The apples are the pride of Normandy; the temperature climate and the undulating meadows are ideal for the production of cider apples. Single distillation can be achieved through a column still or in a traditional pot still for double distillation, the first distillation is known as ‘petite eau’ and the second as ‘bonne chauffe’. Père Magloire 20 Year Old is 'the Jewel of Calvados' and is such a refined and elegant bottle, it is a perfect refuge for this rare and unique 20 year old Calvados. 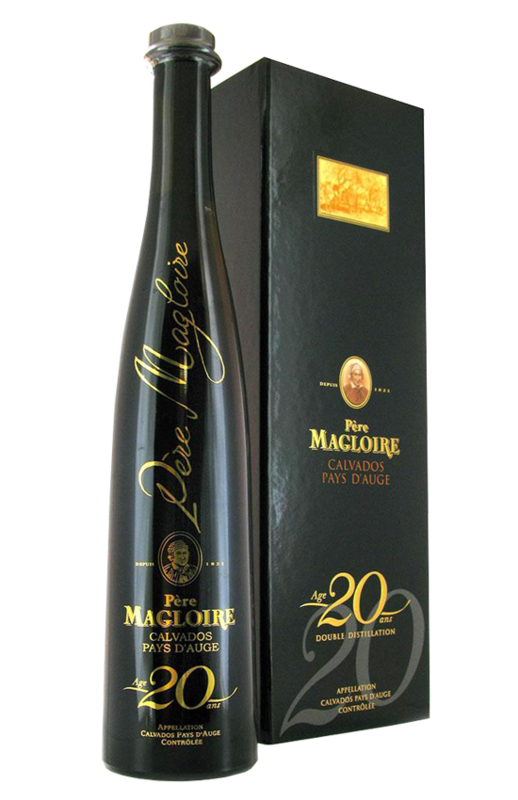 Composed from the finest Calvados which are chosen from exceptional years, Pére Magloire 20 Year Old Calvados has an outstanding bouquet and a perfect roundness which will satisfy even the most demanding palates. Palate: Grilled almond and apple sugar as a reminder of the origin and savour of the country.